The use of straw in dairy cattle diets has increased greatly in recent years. Usage has been primarily in dry and transition cow diets and replacement heifer diets, but there is some usage even in diets for lactating cows. The type of straw used is primarily wheat straw, but oat, barley and triticale straws are also common. These straws are typically chopped prior to feeding and fed at a low inclusion rate in total mixed rations (TMR). The aim of this Focus on Forage article is to answer some of the common questions regarding the use of straw in dairy cattle diets. Why is straw sometimes used in diets for lactating cows? Nutritionists may recommend including some straw in the lactating cow TMR’s for the following reasons: need to increase the effective fiber in the ration for improved rumination, desire to increase rumen fill and (or) or slow the rate of passage of digesta from the rumen when only finely chopped and (or) very highly digestible forages are available on the farm, and the need to extend farm forage inventories. Straw inclusion is typically limited to less than 2 lb. per cow per day to avoid greatly reducing intake or the energy density of TMR’s for lactating cows. Usage is most common in TMR’s for fresh cows. Why is straw often used in diets for dry and transition cows? Researchers at the University of Illinois have been recommending low-energy diets for dry cows formulated by including straw in the diet to restrict the energy density of dry cow TMR’s. This approach has become quite common on dairy farms over the past few years, and when this type of ration is employed it is often fed to both far-off dry cows and close-up or pre-fresh transition cows. This type of ration is commonly formulated using corn silage and straw along with supplemental protein, macro-minerals, trace minerals and vitamins with typical target TMR energy and crude protein concentrations of 0.62 Mcal NEl/lb. and 13%-14%, respectively (DM basis). Straw inclusion typically ranges from 6 to 12 lb. per cow day depending upon straw availability and cost and TMR mixing constraints. Potential benefits of straw for dry cows in addition to dietary energy restriction include reduced dietary potassium and cation-anion difference to reduce the incidence of milk fever and increased rumen fill to reduce the incidence of digestive disorders including displaced abomasum. What are the concepts behind and strategies for using straw in replacement heifer diets? Modern dairy heifer housing systems including free stall barns and well managed bedding pack barns minimize maintenance energy requirements of dairy replacement heifers. Older heifers in these housing systems require low energy (62% TDN) and high NDF (50%) diets. Often, farm inventories of legume or corn silages are too low in NDF and correspondingly too high in energy and feeding combinations of these forages to older dairy heifers may result in over-conditioning. Straw is commonly included in dairy replacement heifer diets to reduce dietary energy intake helping to avoid over-conditioning. Inclusion of straw in the diet of dairy heifers reduces energy density but also reduces dry matter intake of the diet. Dairy heifers will consume approximately 1.0% of their body weight as NDF. A 1000 lb heifer consuming a 50:50 mix of legume and corn silage will consume 25.0 lbs of dry matter and 17.0 lbs of TDN. Inclusion of 4.0 lbs of straw would increase the dietary NDF by 6.5 percentage units, decrease dry matter intake by 3.6 lbs/day and correspondingly decrease TDN intake by 3.4 lbs/day. Inclusion of straw in the diet of dairy heifers is advantageous to reduce dietary energy, decrease feed intake and help prevent over-conditioning, but in some situations inclusion of straw in a dairy replacement heifer diets may not be economical. Straw is often costly because of demands for use in dry and lactating cow diets and for bedding. Other high fiber low energy feeds such as corn stalks, soybean stubble, low quality grass forages or tropical corn silage (no grain) are all suitable feeds to reduce dietary energy and decrease dry matter intake of heifers. In situations where bunk space is adequate, limit feeding heifers may also be an effective management strategy to reduce dietary energy intake and minimize over conditioning. What is the nutritive value of straw and how does it vary? The nutrient values of common straws fed to lactating dairy cows and dairy heifers are presented in Table 1. 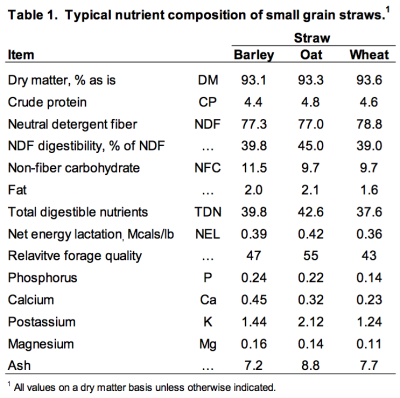 The nutrient composition of small grain straws is similar with straws containing >75% NDF and < 45.0% TDN, but can be quite variable especially the potassium (K) content. When straw is included in pre-fresh diets the K content of straws should be determined analytically for calculation of dietary cation:anion difference. Oat straws tend to be more variable in nutrient composition than wheat or barely straws. Often, oats is planted and under-seeded with legumes such as alfalfa. In some growing and harvest conditions, oat straw may be a blend of oat straw and under-seeded alfalfa, which may significantly increase the crude protein, TDN or K content. How should straw be physically processed for feeding? The particle length of straw must be reduced to allow for proper mixing in the TMR, minimize separation when dispensing the TMR from the mixer, and reduce TMR sorting by cows in the feed bunk. This can be done using a bale chopper or tub grinder prior to adding the straw to the mixer or in TMR mixers designed to physically process feeds. A good rule of thumb is to process straw so that the long particles are about 3 inches in length. How can the practice of animals sorting against the straw in the diet be minimized? Whenever straw is included in the diet of a lactating dairy cow or replacement heifer particle sorting should be carefully monitored. It is well documented that lactating dairy cows and heifers preferentially sort against the longest feed particles in a TMR. Because straw is often the longest feed particle in the diet and because straws are not highly palatable, dairy cows and heifers frequently prefer to sort against consuming straw. Finely chopping straw (<1 in.) may deter feed sorting, but chopping too fine may also defeat the purpose of including straw in the diet (more long fiber). 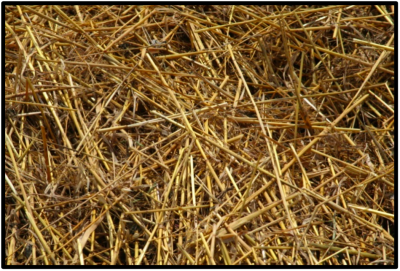 Some common sense approaches can be employed to minimize the sorting of straw. First, whenever straw is included in the diet, the diet should be fed as a TMR and mixed thoroughly. Second, the number of animal units in the pen and the pen dry matter intake should be monitored closely. A TMR containing straw should not be fed in great excess. Feeding TMRs containing straws “tight” to the exact intake of the animals in the pen helps assure total consumption of the diet. If excessive feed waste is occurring, with an abundance of straw in the feed waste, decreasing the amount of the diet offered maybe an effective management strategy to assure full consumption of the straw and the intended diet. Adding water or a liquid molasses supplement to the TMR may also help reduce sorting.